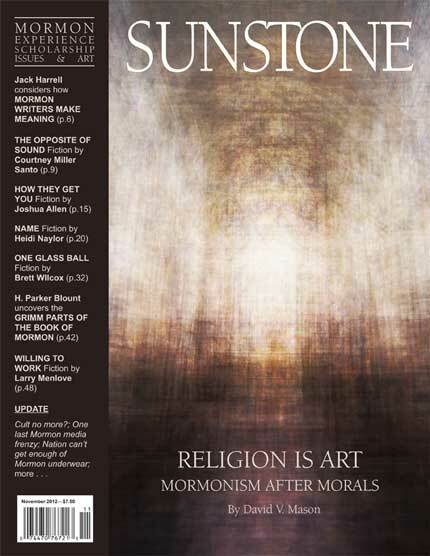 In the latest issue of Sunstone (the latest for me, at least—I always get the new issues a couple weeks later than everyone else), Jack Harrell writes a provocative and, for me at least, difficult-to-argue-with essay about Mormon writing. In fact, I’m tempted to describe it as a manifesto. Sunstone won’t put it online for a few months, but I want to talk about it now. He starts with calling Mormon artists out for our attitudes toward “two forces . . . [which] originated outside of Mormonism, and [that] tempt us to work below our station” (6). For simplicity’s sake in this review, I’ll refer to these forces as absolutism and postmodernism, but I want to be on record as saying that postmodernism means a lot of things to a lot of people and if you don’t how it’s been oversimplified in this post, get over it. Mormon theology does not believe in an absolute God in the traditional Christian sense, a God without body, parts, or passions, who “created an ordered and fixed universe out of nothingness in order to demonstrate his perfections. . . . a determined universe in which all things operate according to his foreknowledge” (6). But, as Harrell observes, this is not the physical father God of Mormon thought. And adherence to the absolutist worldview leads to a stale universe in which things can only happen as they are predetermined to happen. No room for epiphany. No room for risk. Yet in Latter-day Saint cosmology, God created a world with great risks for both himself and his children. The absolutist’s god “resembles Lucifer in the pre-mortal council where he presented his plan . . . [and] none would be lost. But God knew better, understanding that great souls cannot be forged without adversity and risk. Art is the same way” (7). Yet, Harrell fears, the Mormon arts too often “embrace this absolutist worldview” rendering “the meaning we make . . . redundant, familiar, and anesthetizing” (7). Not a good state of affairs, even if it does appeal to the bottom-line. “This ideology argues that the universe is absurd, that there is not such thing as ultimate meaning” (7). We assign meaning to chaos ourselves, signifying nothing. This path Mormon culture is less likely to follow, but it holds great sway outside our doors and is as destructive as absolutism—after all, what is the difference between an ex nihilo creation and nihilism? Don’t they both reject our power to create meaningful work? Don’t they both reject our responsibility to do so? “Mormonism gives us a universe that is meaningful but not determined . . .” (7). Joseph Smith learned that God did not “create” the world, but he “organized” it. Harrell offers a correlation: if light cleaves unto light, must not chaos cleave unto chaos? “Therefore, when God goes out to yonder unorganized matter, he is, perhaps, going to a dangerous place, a wilderness where disorder and confusion reign, where things naturally devolve into disorder. Nonetheless, God enters that corner of perilous chaos and creates something from the raw materials there” (8). Hence, the title of this post. The postmodernists are not wrong in seeing a natural state of meaninglessness. What they’re wrong about is when they suggest meaning is not possible. Meaning is possible. When God created the world, he made the stars “‘for signs,’ to spark the further making of meaning”—and God called his creative periods “days,” causing them “to exist as distinctive periods because God named them so” (8, emphasis mine). Likewise, when we take our random, disordered experiences and choose “arbitrary signifiers,” we become as God, bringing meaning to the world. Harrell suggests that even artistic failures find precedent in a “God who lost a third of his spirit children” (8). We live in a world where the absurd assaults us. But we have a better option than pretending that this world is the best of all possible worlds because God made it so. The world has meaning and purpose because God gave it such. And we as people, artists, children of God, are able to similarly endow our own works and creations with meaning and purpose. It is our divine heritage. It is our theology. This was a fiction-heavy issue of Sunstone. You can read my brief reviews of all the stories here: http://thmazing.blogspot.com/2013/04/five-sunstone-stories.html. I’m not getting over it. Postmodernism (or at least some strains of it) doesn’t necessarily argue that there is no meaning — just that it’s impossible/slippery to reach and is always under construction. Which is a lot like the position that it sounds like Harrell arrives at. I do agree, however, with Harrell’s uniquely Mormon take on artistic creation and meaning as you’ve presented it. I’m actually quite fond of being described as postmodernist, myself. I almost said as much yesterday in ward conference when our stake president gave a Sunday School lesson around Marlin K. Jensen’s counsel, to not study church history too little. I find it pretty easy to fit whatever curious facts and details into my understanding of Mormonism—and I blame my postmodern mind. Oakland Stake has had such a run of awesome stake presidents. We are certainly blessed in that respect. Modern religion suggests that God created the world out of nothing. But this idea that “nothing” is the opposite of “creation” is relatively modern thinking. Anciently, Near East traditions and texts held that there was something far worse than “nothing.” The shapes and forms, the voids and entities all vary to one degree or another but almost always there is a malevolence to it and our language best renders the composite of it all as “chaos.” To modern sensibilities, it is almost blasphemy to suggest that God created the universe as a literal act of creative will, let alone that there might have been some as-of-yet-poorly-understood-by-mortals peril involved. Even modern Judaism is uncomfortable with this ancient understanding, believing it to suggest, as one scholar put it, that “God built his kingdom upon a garbage dump.” But in the ancient Near East, according to the narrative tradition and understanding of those who wrote the very Bible we believe to be true (so far as it is translated correctly), to say that God had descended into and subsequently subdued chaos was to offer the very highest of praise. The language of absolutism is a common language, occurring with extraordinary frequency throughout human discourse. This statement is rendered in absolute terms–even if, as Wm states above, it’s an inaccurate appraisal of the postmodern stance. When it comes to absolutism, Mormonism (or religion generally) is hardly the sole holdfast. It’s a common narrative stance–the impulse to circumscribe, to say what something only is or can only be or just is. Only by temporarily shedding the accepted perceptual logic of his culture can the sorcerer hope to enter into relation with other species on their own terms; only by altering the common organization of his senses will he be able to enter into a rapport with the multiple nonhuman sensibilities that animate the local landscape. Existentialism holds that the universe is meaningless, but that we can create our own meaning. The meaning we create is just as, if not more real than meaning imposed upon us. So, ET: Can we compare God’s descent into chaos to create the world, to Christ’s descent into hades (“the harrowing of hell”) to organize a body of redeemed souls? Joseph F. Smith’s vision in D&C 138 emphasizes the ordering aspect of Christ’s work in the world of post-mortal spirits, of ordaining and dispatching missionaries from among the great souls of earlier ages. As I understand it, absurdists already advocate the construction of meaning, but assume that individuals have radical leeway in the way they do so. Mormonism seems to suggest the lasting meaning can only be constructed within the far narrower constraints of eternal principles: “wickedness never was happiness” is a limit on the space in which intelligences can construct enduring meaning. Lehi’s theology posits a God whose power is similarly circumscribed: he is God because he works in harmony with an eternal way of Godliness. Our idea of exaltation seems to be linked to the notion of a way of Godliness which precedes God the Father. I don’t know how this relates to Jack’s article, which I have not yet read, but I think it’s worthwhile to talk about as we discuss the parameters under which meaning is constructed in our theology. Parameters matter, I agree. Not all creation is good. I could invoke Godwin’s Law to prove my point, but instead I’ll just agree with James’s more scriptural phrasing.